"We are looking at networks to think about how communities are structured over space," says Carlo Ratti, an associate professor in MIT's Department of Urban Studies and Planning, director of MIT's Senseable City Lab, and a co-author of a new paper summarizing the results. The study is part of a larger effort, he adds, to see "how we can use these technologies to better understand the extent of constituencies and communities." The paper, "Delineating geographical regions with networks of human interactions in an extensive set of countries," is being published this week in the journal PLoS ONE. The findings show that, for all the digital connectivity in civic life today, people still connect in "a geographically cohesive, connected set of communities," says Stanislav Sobolevsky, a researcher at the Senseable City Lab and a co-author of the paper. In France, patterns of communication closely mirrored the nation's historical administrative regions, although the data also reveal a larger east-west divide running almost the length of the country. 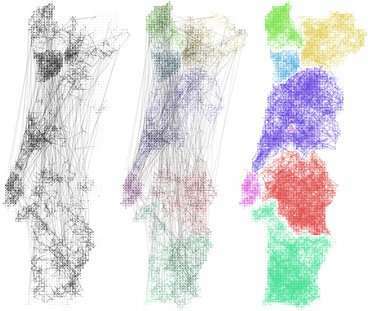 "What's impressive about this work is that they show that using phone calls in this way produces clusters and subdivisions that make great economic and political sense," says Michael Batty, a professor emeritus of planning at University College in London, who has read the paper. Even when patterns of communication reflect pre-existing political or administrative lines, Ratti says, they can still represent "a more natural geography that emerges from people," and can be studied over time. "You can see in advance how well newly proposed borders match with the actual human interactions," Szell says. "We're more interested in the theory behind it," Ratti says, "and in how this can contribute to a 'science of cities.'"